Standard accessories DMC-GX80W Kit/Hot Shoe Cover, Battery Pack, AC Adaptor, USB Connection Cable, Shoulder Strap, Lens Cap x 2, Lens Hood, Lens Rear Cap/・ The DMC-GX80 Operating Instructions for advanced features is available for downloaded at Panasonic LUMIX Customer Support Site using PC, smartphone or tablet connected to the Internet. 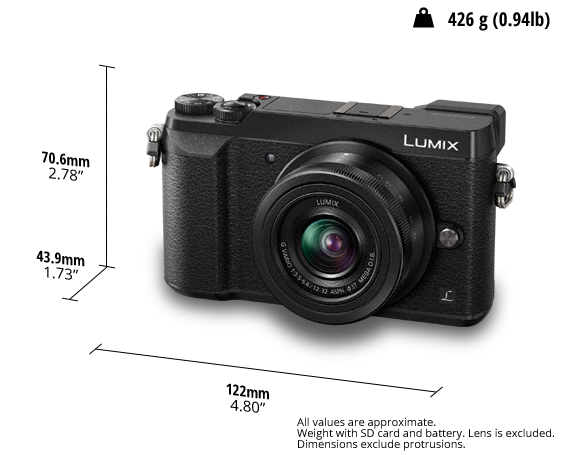 INTERCHANGEABLE LENS-2 Lens Name LUMIX G VARIO 35-100mm / F4.0-5.6 ASPH. / MEGA O.I.S. NOTE * About motion picture recording / 4K Photo recording - Use a card with SD Speed Class with "Class 4" or higher when recording motion pictures. - Use a card with SD Speed Class with "UHS-I UHS Speed Class 3 (U3)" when recording motion pictures with [MP4] in [4K] or [4K PHOTO]. (SD speed class is the speed standard regarding continuous writing.) - Recording stops when the continuous recording time exceeds 29 minutes and 59 seconds with [AVCHD] in Europe. - Recording stops when the continuous recording time exceeds 29 minutes and 59 seconds or the file size exceeds 4GB with [MP4] in [FHD] [HD] [VGA]. - Recording stops when the continuous recording time exceeds 29 minutes and 59 seconds with [MP4] in [4K]. - When using an SDHC memory card: You can continue recording without interruption even if the file size exceeds 4 GB, but the motion picture file will be divided and recorded/played back separately. - When using an SDXC memory card: You can record a motion picture in a single file. - When the ambient temperature is high or continuous recording is performed, the camera may stop the recording to protect itself. Wait until the camera cools down. ** For [4K] video output, use an HDMI cable that has the HDMI logo on it, and that is described as"4K compatible".